When theatre is done right, every element of your experience as an audience member should be of the same tone. Not just what you see on the stage, but the music you hear, the space you enter, and even the program. 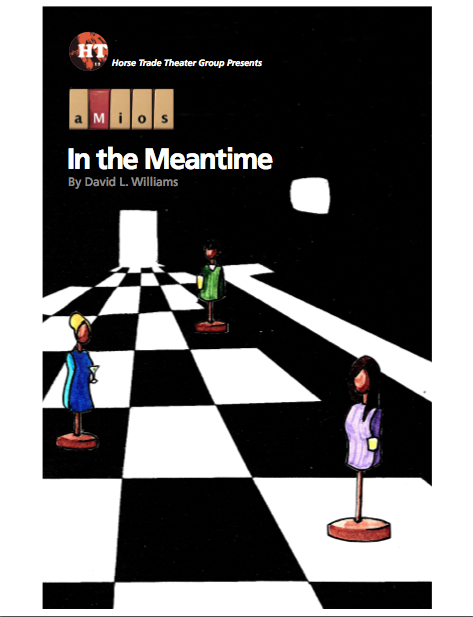 That's why I love this program of "In The Meantime," my most recently produced play as of this writing, so much. The chess board pattern immediately sets the tone that you're going to see games being played, but you're also going to see a battle. You also learn that these aren't old-timey queens and knights; they're three people in contemporary clothes, and they're all drinking. Plus, at the very back, there's a way out, but boy does it look far away. Terrific program art for a terrific production! Thanks, aMios, for the production and thanks, TED Otting, for the artwork! !